A visit to the Inter-Tabac trade show in Germany is always exciting for us, especially when we can combine it with visits to other suppliers, new and old, in Europe. Before reaching Dortmund we visited a bulk pipe tobacco manufacturer in northern Germany (more of this visit later) and the factory of de Hertogh cigars in Belgium (formerly “Young” cigars). Here we discussed ways, and means, to navigate the South African health warning requirements necessary to import again these brilliant, short filler boutique cigars. New this time, we found that they have created a Petit Corona in a blend especially suited to smoke with a Whiskey or Cognac tasting. How is that? Actions are now underway to hopefully have some cigars before the year end. In Dortmund things really move fast. The halls are quickly filled with both local and International buyers, especially on the Saturday. Fortunately we had been able to schedule appointments with most of our major suppliers on the opening Friday, and they were able to give us sufficient time to discuss our needs. On the stand of our major cigar accessory supplier we topped up our usual product range - then finished with the standard question. In response we were shown some Colibri cigar cutters for larger ringsizes, quite beautiful. We also chose a few more smaller items which were interesting, but it was when we looked at the humidors that we really perked up. There were some very tempting “show specials” on offer. An entry level “deco-tactile” walnut humidor for 25-30 cigars. The ripple ridged, walnut exterior finish is stylish and scratch resistant. The cedar lined interior is neat and clear of blemishes. The standard hygrometer and humidifier are not mounted so the option to upgrade the humidifier is easy. The price at R995.00 is a giveaway – only 20 available. The humidor can hold 40/50 cigars and is stunningly finished in black leatherette with a padded top and red topstitching. The set includes a matching black cigar ashtray (red topstitching), a stainless steel two finger cutter, and the basic instruments. Again these are not mounted making upgrade options possible. The price at R2495.00 is worth serious thought - only 10 available. For either humidor you could use a suitable model of brand Bead Humidifier to upgrade the humidifier. Don’t even think about it, add it - it’s almost for nothing! As I said in the article of October 23, a visit to the Inter-Tabac trade show in Germany is always exciting for us, especially when we can combine it with visits to other suppliers, new and old, in Europe. In Dortmund things really move fast – we had pre-booked meetings with our pipe suppliers and, as usual, found the visits very interesting. On our visit to the Dunhill “Whitespot” stand we selected some stunning new pipes to add to our pipe selection, including the 2014 Christmas pipe. Our allocation is only one, and it is magnificent. A picture will join the rest of the range on the website soon. The Stanwell stand was amazing. The production move to Italy is now well bedded down, and we are starting to see the successful blending of Italian flair to the classic Scandinavian style on which the brand has been based. Our order is “in the air” at this time (more news to follow). On the Lorenzo stand Riccardo, and his son Massimo, were their usual gracious selves. We have their word that our order will be here in 2014, but we are not holding our breath. Savinelli had its own stand this year, which was much more accommodating and open. And our shipment includes some pipes specially ordered by local pipe customers back home. The order is close at hand. Finished with the pipe circuit, we made our way back to our accessory supplier. We topped up our stock levels for Christmas: Pipe knives, Passatore Pico pipes, amongst other things. The response to my next question: “what’s new?” came as a pleasant surprise. It was a pipe and tobacco carry case – I started ticking the plus point boxes. Ten out of ten – if the price was right. There were a few minor finishing flaws, and the price was even better than I had hoped! The bag should have retailed in South Africa for R495.00, but the price he offered would make it possible for us to sell it for only R295.00. Only 25 available, so if you are in need of a very practical carry case when you take your year-end break, make sure you respond promptly. PS As we were leaving the show on the Sunday, we literally bumped into a very old friend Erik Nording – the Danish pipemaker. We were both in a hurry but he took the time to say “Hello” and thrust a packet into my hand. More about this packet later. Carry care for your cigars. How bad is it when the opportunity unexpectedly arises to enjoy a cigar, even for half an hour, and you don’t have one with you! So you decide to carry a couple of cigars with you whenever you leave home. You take out your cigar and it is dry and hard, or falling apart!! We have three options in cigar cases which fit your pocket, and which should ensure your cigar will be fresh when you are ready to enjoy it. Airtight Chrome Tube for a single cigar –73-J3608. Length up to Churchill at a pinch. Hint: If your cigar will be in the tube for some time,you can ask us for a sponge. Then before putting the cigar into the tube, moisten the sponge with water – just a drop – and insert it into the tube. The leather case is really good leather – you know how that smells and feels. 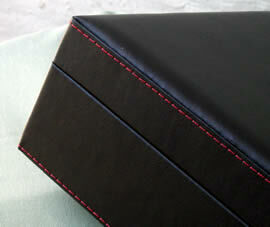 And there is no other cigar case with a belt loop! Replaceable, firm closing, airtight glass tubes for cigars up to 150mm long and Ring 51 (the diameter of a Robusto). Length up to Corona Extra. There are few manufacturers in the world who can make a Spanish cedar cigar case of top quality, as two different type of craftsmanship are required: one for leather and the other for Spanish Cedar. Precision in measurement and perfect hand work is critical, so that the case closes smoothly, and at the same time when you hold the top, the bottom does not fall out. It is virtually airtight - close it against the palm of your hand and feel the air being squashed out. Interested in the detail: note the elegant stitching and the smooth inner finish of the Cedarwood fitment. Hint: If your cigars will be in the case for some time, before putting them in moisten the cedar with water – very, very lightly. Since Cedar is the ideal medium for storing cigars (think cigar boxes) – don’t miss the opportunity to add this Spanish Cedar-lined leather 2-cigar case to your cigar essentials. The cigar is a natural filter. Every time you draw the smoke through the cigar, tars and moisture condense and are absorbed by the leaves. The condensate builds up as the cigar burns up, until a point is reached where the concentration of juices affects the flavour of the cigar, and ultimately your enjoyment. The smoke becomes harsh and bitter. It’s time to put the cigar down and let it go out gently by itself. How can we extend the smoking time before it becomes too harsh? 1. The Cut – the narrower the cut the greater the speed at which the smoke is drawn through the opening. This encourages the juices to deposit at the head of the cigar and transfer in the smoke, giving it a harsh taste. Make a cut as wide as possible (but not beyond the cap line) bearing in mind that it must be comfortable for you, so that you draw regularly and gently. 2. The puffing rate – too often / too hard will give you a hot smoke which encourages the juices to deposit. Allow a short cooling-off time between each puff. In practice: About 1- 2 puffs per minute should keep the cigar alive, and prevent excessive deposits. The pipe is a natural filter. The smoke cools down as it is drawn to the base of the bowl, along the shank and through the mouthpiece – filtering out tars and juices on the way. It is not possible for a pipe to stay clean and dry while you’re smoking it. Filtering tars and juices is the up-side, one of the advantages of pipe smoking. The downside: What to do with the filtrate? 1. Keep the smoke cool so that the deposits occur in the stem and don’t come through to the lip of the mouthpiece – giving a harsh smoke. Puff just fast enough to keep the tobacco alight, but don’t worry if the pipe goes out - shake off the ash, tamp down and relight. 2. Absorb the deposits in the base of the bowl (bowl filters) and from the shank of the pipe with one of a variety of filters. 3. Packing the tobacco. Feed the tobacco into the bowl, pinch at a time. Press down and check the draw - it must be firm but not too tight. To start with you may have to test the draw with each pinch but in time it will be second nature to pack it just right for you. If you have filled the pipe, but it doesn't draw comfortably, empty it out and start again. If the draw isn’t right for you, you are likely to draw too hard. We recently talked about the differences between lighting a pipe and lighting a cigar. A turbo lighter can be used for a cigar, especially when there is a breeze, but is no good for a pipe, you may well end up burning the wood. A normal angled butane flame is safer and easier to use. So if you are a smoker of both pipe and cigars, the answer is to carry two lighters? A recent addition to the EUROJET range of lighters is the “Aberdeen” combo lighter R295.00. It offers an angled butane flame for the pipe or cigar AND a single-jet Turbo flame to use when conditions demand it. You simply choose which is best at the time! An innovative lighter, at a good price. No need to make life more difficult than it already is! PS Dunhill Gas (R89.50 per 50g can) is the only gas which is labelled Turbo Compatible. The purity of Dunhill gas ensures that valves are less likely to clog and malfunction, and the anti-corrosive properties protect all metal parts, thus considerably extending the life of your lighter. For many years we have said that dry-smoking pipes are technically the best-designed pipes for all and sundry pipe smokers. By “dry-smoking” we mean a pipe with a built-in moisture trap – a tried and tested system. Bent pipes are usually the most effective, and in addition tend to be much lighter on the jaw. Particularly for new pipe smokers, they ease the way. Our customers have confirmed this. As prices for this type of pipe were rising, we wanted to find a pipe at a more reasonable price. Marca Parma, Marca 6, Marca Mignon, Marca Sport have all been exceptionally well accepted as quality pipes at reasonable prices. So, in 2012 we sat down with them to discuss the possibility of a Marca Dry pipe for us. A pipe with a “sump” which collects the moisture that forms naturally as the pipe is smoked (a pipe is a natural filter). This produces a much drier smoking experience. Because the design would be new to the factory, and it would have to be slotted in to their already busy production, we would need to be patient. Three shapes in both smooth and sandblast, showing excellent grain patterns with minimal surface imperfections. Another choice: Taper or Saddle mouthpiece, whichever pleases your eye. The stability of the free-standing shape 120 is a good example of the skill of the pipe maker, and the care given to the feel and balance of each pipe. Note: clean the sump regularly with a folded pipe cleaner (and a shot of pipe spray) – to enjoy fresh smoking for many years. A “filter” may be used to mop up excess moisture, helping to keep the moisture trap clean and dry. Three different 6mm filters are enclosed for you to try: Charcoal, Balsa, Paper Tubes. adapter is included for use when you choose not to insert the filter. The Marca Dry retails for only R850.00. I am pleased to be able to offer you this well designed, beautifully made pipe, at a good price. The Marca Dry is a “must have one” in any pipe collection.